Steve Burnham of BluesBBQ.net has done it again with yet another great tasting sauce. 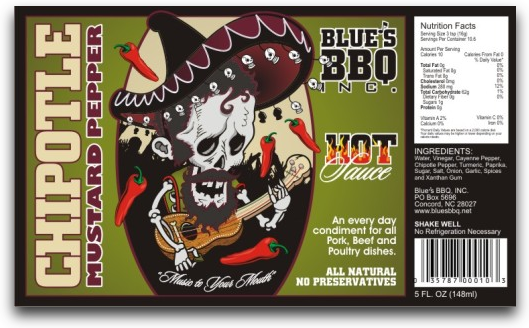 From his stable of sauces that include his flagship products, Carolina Pepper Sauce, both Mild and Warm and Blue’s Habanero Reserve Hot Sauce – Steve has recently introduced his newest sauce, Blues BBQ Chipotle Mustard Pepper Sauce. Wow! 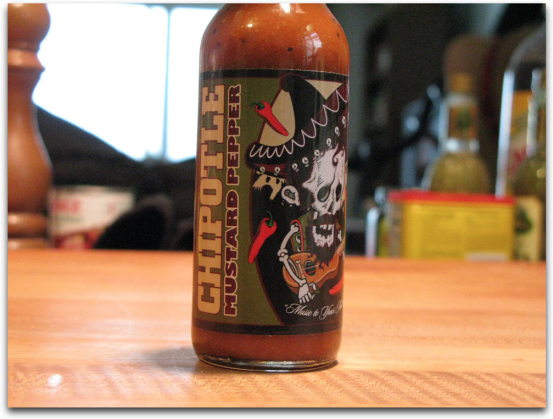 Chipotle (shoot me now, because I love Chipotle peppers) and mustard (again, I’m in Heaven) – you now have my full attention. But wait… it’s not truly a “mustard” based sauce. I’m OK with that, now that I know. There’s a hint of mustard from the tumeric in the ingredients, hence the “mustard” in the name. 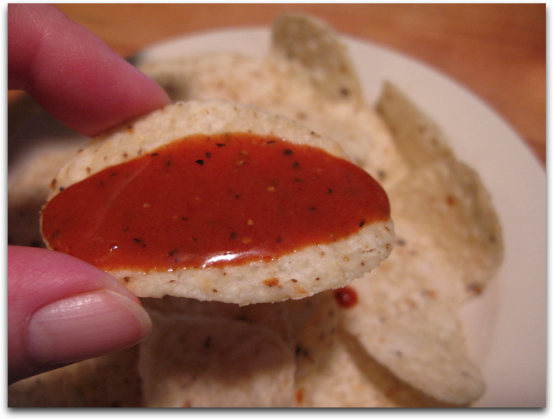 But be aware, this is a “hot sauce” by all intents and purposes. And boy is it flavorful. There is going to be a lot of confusion with this one. It isn’t a mustard at all but is a hot sauce with a mustard taste. Truly unique. Pours like a hot sauce and tastes like a smokey, mustardy cayenne hot sauce. I probably should of named it “Blue’s Unique Majic Hot Sauce that somehow tastes like Mustard”. Once ya’ll try it, you’ll know what I mean. You’re gonna like this one! You’re right, Steve! I do like this one. I first tried Blues BBQ Chipotle Mustard Peppers Sauce on wings. Straight up. Folks, in my opinion, this is not a wing sauce. This is a hot sauce, with a very unique flavor. Marilyn: This has all the earmarks of a great Carolina style Hot Sauce with plenty of vinegar and lots of heat. One of the predominant flavors I’m getting is black pepper and I don’t think there’s enough of the smokey Chipotle in the recipe. This sauce definitely has a depth of flavor not found in traditional Cayenne based hot sauces. Brian: This sauce has some serious heat. On a scale of 1 – 10, I’d give it a 7. It’s both hot and vinegary. I do get a hint of mustard from the tumeric, but it’s not overwhelming. And while I’d like to have more mustard flavor in the sauce, it still works. I do agree with Marilyn that there’s not enough Chipotle in the mix because I love Chipotle. Do yourself a favor and go to BluesBBQ.net to order a few bottles of their Chipotle Mustard Hot Sauce and try it for yourself, or as a Valentines Day Gift for the Chilehead Lover in your life. And while you’re there, please get yourself a bottle or 2 of their great Carolina Pepper Sauce… it’s an awesome table sauce (no refrigeration) and rocks in pulled pork. This is one of my favorite new sauces of the past few months. 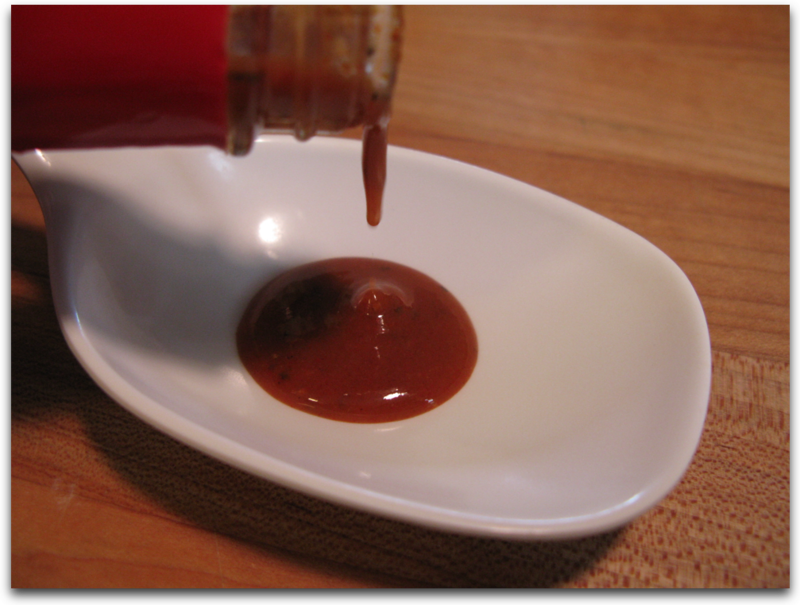 I think it’s an excellent table sauce and can go well with a lot of things one would apply ketchup or BBQ sauce to. Very odd that you had given this a 7 out of 10 on heat. The bottle I had was very mild, probably no higher than 2 out of 10 for me. It’s smokey, peppery (as in black pepper) but not tongue-burning. I HAVE to order this. You had me with the reference to a carolina style vinegar sauce and I have plenty of pulled pork on hand. Hey Chris, while you’re there, get a bottle of his Carolina Pepper Sauce. Steve’s shipping rates are low, and you won’t be sorry you got both sauces! Tell him Brian from HSD sent ya! I appreciate the kind words and great review. I think in time, this sauce will become better selling than both the Habanero Reserve and Carolina Pepper Sauce. According to my label designer, The label is supposed to be a blend of Ed Hardy and the Grateful Dead. Does anyone else agree? Hey that’s good to know, Steve. All of the Blues BBQ sauces are excellent!